Pato Mena is a writer and illustrator of children's books, or, in other words, the kind of person who enjoys what happens when you put texts together with pictures. He was born and raised in Chile but currently lives in Barcelona. 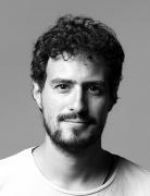 He has published work in Chile and Spain and has twice been awarded the Chilean Government's Beca Creación (creativity grant).